Rev. Gains Harrell Lewis Sr. Provide comfort for the family of Rev. Gains Lewis with a meaningful gesture of sympathy. Rev. Gains Harrell Lewis, Sr.-age 86 of Maynardville went to his Heavenly Home Friday morning, December 14, 2018. Harrell, above everything else, loved the Lord Jesus Christ as his Saviour preached and witnessed so others would do the same. He was saved and was a member of Hubbs Grove Baptist Church and attended Fellowship Christian Church. He had pastored Leatherwood Baptist Church and Head of Barren Baptist Church. 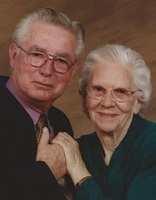 He was proud to be a lifetime citizen of Maynardville, Tennessee and was well-known and had many friends and family. He was a carpenter by trade and the proud owner of Lewis Building Supply for over 60 years. Harrell was a veteran of the United States Army spending most of his time in Germany. He was preceded in death by the love of his life and companion, his wife, Ima Ruth Cooke Lewis; parents, Jesse Lee and Anna Smith Lewis; sons, Gains Harrell Lewis, Jr. and Timothy Lee Lewis; son-in-law, Allen Jarvis and an infant brother. Harrell is survived by his daughter, Patricia Ann Lewis Jarvis; granddaughters, Lori Clay (Ronnie) and Misty Seal (Damon); great-granddaughters, Kalee Clay, Halli Seal, Layla Seal, Emily Clay and Lucy Seal; sister, Trilla Lewis Walker; sister-in-law, Mary Lee Vining. His favorite saying was “What am I going to do with all these girls?” He loved and cared for them was the answer. The family would like to express their appreciation and thanks for the love and care that was given to him at Maple Court Assisted Living for Memory Care. The family will receive friends 3-5 p.m. Sunday, December 16, 2018 with funeral to follow 5 p.m. Sunday, Cooke-Campbell Mortuary Chapel, Rev. Johnny Smith, Rev. Joe Norris officiating, music by Patricia Jarvis, Justin Smith and Damon Seal. Interment 11 a.m. Monday, Monroe Cemetery, Maynardville with military graveside rites presented by Tri-County Veterans Honor Guard. Family and friends will meet 10:15 a.m. Monday at the funeral home to go in the funeral procession. Pallbearers: Damon Seal, Danny Smith, Bruce Williams, Justin Smith, Glenn Cooke and Mark Cooke. Honorary Pallbearers: L. D. Monroe and Troy Oliver. Arrangements by Cooke-Campbell Mortuary, Maynardville. Interment 11 A.M. Monday, December 17, 2018 with military graveside honors presented by Tri-County Veterans Honor Guard. We encourage you to share your most beloved memories of Rev. Gains here, so that the family and other loved ones can always see it. You can upload cherished photographs, or share your favorite stories, and can even comment on those shared by others.